Noctua's DX line CPU coolers have become a default choice in premium grade quiet cooling solutions for Intel Xeon processors. The NH-D9 DX-3647 4U features a larger, custom-designed contact surface and supports both square and narrow type LGA3647 platforms. Based on the proven, 92mm size NH-D9L heatsink and equipped with two of Noctua's award-winning, PWM controlled NF-A9 92mm fans (high-efficiency 2500rpm version). It combines strong performance with excellent compatibility for 4U systems and other space-restricted applications. Topped off with the professional SecuFirm2 mounting system and pre-applied NT-H1 thermal compound, the NH-D9 DX-3647 4U forms a complete premium quality package for quietly cooling LGA3647 based Xeon workstations and servers. Thanks to its compact footprint (95x95mm with center fan only, second fan can be installed on either side depending on available space) and a total height of only 134mm, the NH-D9 DX-3647 4U provides excellent PCIe compatibility and is small enough to fit most 4U size rack-mount enclosures. The NH-D9 DX-3647 4U is equipped with two of Noctua's award-winning NF-A9 92mm fans in their high-speed 2500rpm HS-PWM variant. 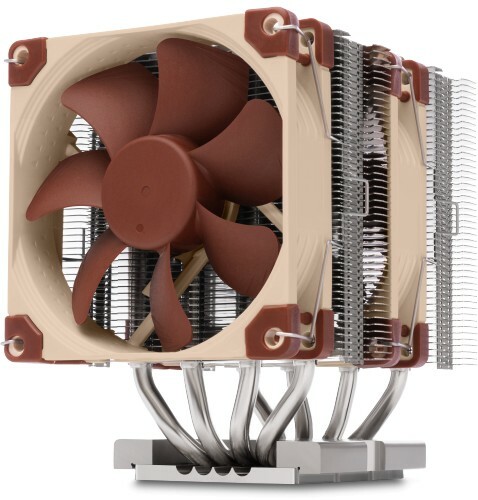 This push/pull dual fan configuration makes it possible to achieve a level of cooling performance that is remarkable for such a compact cooler and comes close to the bigger NH-U12S DX-3647. The NF-A9 premium fans supplied with the NH-D9 DX-3647 4U support PWM for convenient automatic speed control through the motherboard, which allows them to run near silent at lighter loads and to speed up only when necessary. The supplied Y-cable makes it possible to power and control both fans simultaneously from a single motherboard fan header. Noctua products are renowned for their impeccable quality and outstanding longevity. True to this legacy, the NH-D9 DX-3647 4U heatsink is built to last, and like all Noctua fans, the supplied NF-A9 units feature an MTTF rating of more than 150,000 hours. The entire package comes with a full six year manufacturer's warranty.